While most clothing companies are racing to the bottom with cheaper, disposable clothes, we still believe in high quality, both in clothing anD experience. That's why we are dedicated to providing the best possible experience to our clients, and it shows with over 220 five star reviews. A typical first appointment lasts anywhere between one and two hours, and we are meticulous in taking over 20 measurements, as well as putting our clients in a try-on gage to see how the fabric drapes. 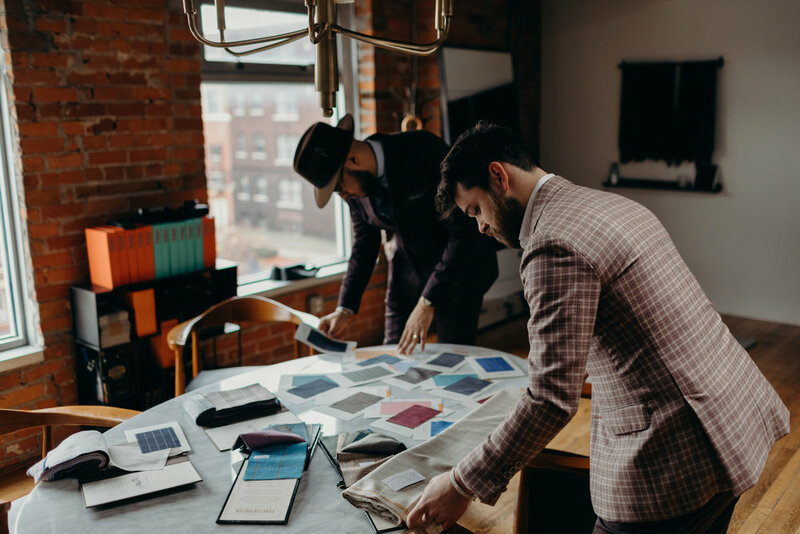 We then pick apart the suit, scrutinizing every seam, and work with our clients to understand exactly the look they are going for; be it a slimmer modern suit, or a fuller traditional cut. After the measurement process, we're ready to design. We have thousands of fabric samples that are refreshed twice a year from the world's best Italian and English mills: Loro Piana, Zegna, Vitale Barberis, Huddersfield and Holland & Sherry to name a few. This is where our experience comes in to help you design the wardrobe of your dreams. We know our way through the fabrics so we can build the closet you envision.